Explanation: Newborn stars are forming in the Eagle Nebula. This image, taken with the Hubble Space Telescope in 1995, shows evaporating gaseous globules (EGGs) emerging from pillars of molecular hydrogen gas and dust. 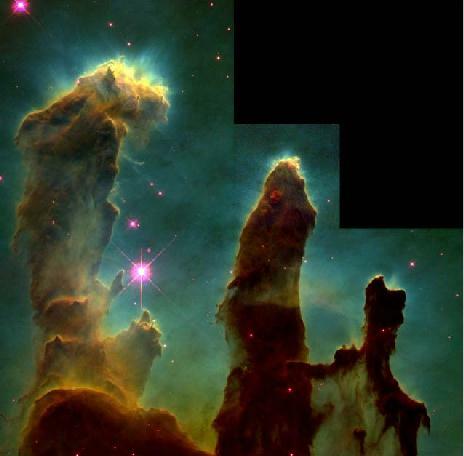 The giant pillars are light years in length and are so dense that interior gas contracts gravitationally to form stars. At each pillars' end, the intense radiation of bright young stars causes low density material to boil away, leaving stellar nurseries of dense EGGs exposed. The Eagle Nebula, associated with the open star cluster M16, lies about 7000 light years away.